Neanderthals – we use this word for an uncultured and obtuse person. Several misapprehension prevails about Neanderthals, for instance, they are dumb and uncivilized. We can define Neanderthal as an extinct species of ancient humans who were replaced by early modern humans. They inhabited Eurasia from Atlantic regions to Central Asia. Similar archaic humans lived in Eastern Asia and Africa at the same time. There are numerous Neanderthal facts and one of the amazing facts about Neanderthal is that they were as elegant as humans. But it is not the only fact, there are other surprising facts about Neanderthals which will fill you with astonishment. Marcellin Boule supposed Neanderthals as the misplaced link between humans and apes, but this interpretation was wrong as Neanderthals walked straight. If researched between Neanderthals Vs humans, the former could have been better positioned. Researchers have found that the neck and spine were arched indicating straight posture concluded that they can walk straight. The hip of the skeleton also indicated straight posture just like Homo sapiens. Neanderthals lived on the Earth with two other species – Neanderthals and Denisovans. When the Homo sapiens migrated from Africa they went towards Eurasia and mated with Neanderthals. Scientists have found that Asian and European has two percent Neanderthal genes but Sub-tropical Africans don’t have the same. Homo sapiens mated with Neanderthals and Denisovans as they all belonged to the same group – Homo heidelbergensis. Spanish Anthropologists Policarp Hortola and Bienvenido Martinez-Navarro hypothesized that as Neanderthals migrated from Africa to Europe, they became prey for humans. 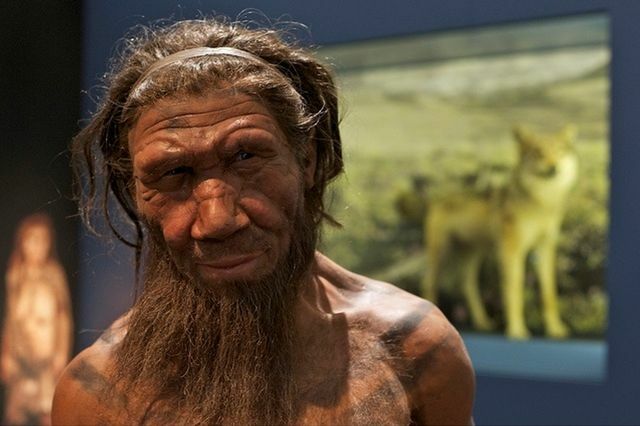 Researcher Fernando Rozzi of the Central National de la Recherche Scientifique in Paris ascertained that there were cut marks on the bones made by humans, which proved that humans could have feasted Neanderthal man. One possible reason for the extinction of Neanderthals could be human hunting because Neanderthals vanished at the same time when early humans started to live in Europe. Neanderthals made paintings on caves which are considered the oldest cave painting in the World. They drew something like a ladder with red dye on the walls of a Spanish cave which is enough to prove that they were artists also. Another two cave paintings were discovered by researchers in Spanish caves and these three paintings depicted that they were made before Homo sapiens arrived Europe. If Neanderthals and humans were compared it will be proved that both have almost the same apprehensive abilities. In 1856, the first fossil of Neanderthal was found in the Valley of Neander, Germany. A 17th century German Minister Joachin Newmann wrote hymns in the name of Neander, which means Newmann in Greek. Neanderthal was named after this minister who frequently went to this valley. ‘Neander’ and ‘Thal’ was later mixed up to form ‘Neanderthal’. As Germans don’t use ‘Th’, ‘h’ was removed from the word Neanderthal in 1904, but it remained in the word in other parts due to variances in spelling and pronunciations. Ernst recommended the name Homo Stupidus for the Neanderthals as people don’t have perfect knowledge about them at that time. Still, people think that Neanderthals were dumb and don’t have the ability to draw also. But Neanderthals could draw, have emotions for their closer ones and may have also spoken some language. Investigation of a 120,000-year-old toe bone found in Altai Mountains of Siberia in 2014 disclosed that Neanderthals could have been siblings, they had intimately related parents. Another fossil 50,000 years old found in Croatia also revealed that they descended from intimately related parents. Inbreeding among Neanderthals led to malformation in different body parts which may the cause for their extinction. Though largely suppressed, still some of the genes are present in modern-day humans. Another astonishing fact about Neanderthals was that they were cannibals which mean that Neanderthals ate Neanderthals. It is still a matter to be decided whether Homo sapiens ate Neanderthals or not, but after researching bones of five 40,000-year-old Neanderthals, scientists have concluded the fact. They could have become cannibals for lack of nutrition as Homo sapiens, Neanderthals and other related species were of the same standard. Neanderthals could have hunted horses, deer, etc, but it is still not lucid why they ate their same species. As per researchers, they could have also done the same for the bone marrow or maybe also for cultural reasons. Researchers have found that Neanderthals were eaten by other animals also as they have found one child fossil which was eaten by a big cat. Another 115,000-year-old case was detected where a Neanderthal child was eaten up by a bird. There could be possible clashes among Neanderthal man and other creatures because all depended on the same sources. Another amazing fact about Neanderthal is that they used to bury the dead as 50,000-year-old remains of a Neanderthal was unearthed by Archaeologists in a cave in La Chapelle-aux-Saints, France in 1908. It was confirmed by William Rendu and his team of New York University in 2012 that Neanderthals buried the dead. From these burials, it can be concluded that they used to take care of their near and dear ones. Till now it has been found that the possible reason for the extinction of Neanderthals may be hunting or inbreeding. Other researchers are of the view that they may have been infected by some deadly diseases, or they could not have matched the reproduction pace of humans. Some researchers also believe that during the two ice ages, all plants and animals died, which may be the reason for the extinction. Another view put forward is that they have survived the first ice age, and during the second ice age, they interbred with humans and became a part of humans.